As China’s largest smart parking operation service platform and the only AI innovative application enterprise in China’s static transportation industry, Alpark was invited to attend the 16th Annual World Transport Convention organized by the World Bank in its headquarters in Washington. Washington, US - January 20, 2019 /PressReleaseAgency/ — As China’s largest smart parking operation service platform and the only AI innovative application enterprise in China’s static transportation industry, Alpark was invited to attend the 16th Annual World Transport Convention organized by the World Bank in its headquarters in Washington. Alpark delivered the keynote speech titled Alpark Ushers in the Era of Smart Parking 5.0, and was also the only Chinese Smart Transport company invited to the summit. As the most important convention in the global transportation area, the Annual World Transport Convention is extremely important, and its participants include state leaders, important government officials and enterprise executives from different countries, as well as industry organizations, the world’s top financial capital and enterprise executives. The summit aimed to discuss how the digital revolution energize the transportation industry, focus on new solutions brought by technologies like big data and artificial intelligence, and conduct in-depth analysis in areas like travel safety, congestion reduction and green travel. The summit’s purpose of using cutting-edge technology to solve transport problems matches perfectly Alpark’s static transportation smart parking concept. 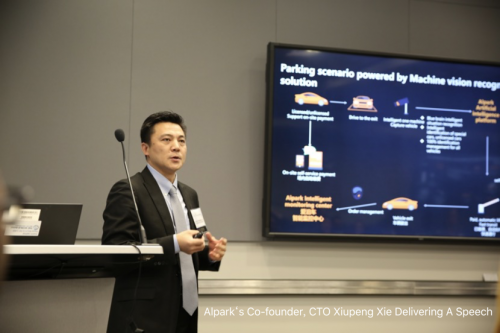 On behalf of Alpark, Alpark’s Co-founder,CTO Xie Xiupeng explored future transport development trends together with senior government officials and technical experts from around the world, and systematically explained Alpark’s static transportation smart parking concept. This was also the first time for a Chinese smart parking company to demonstrate leading smart technology originated in China to the world on the international platform. Alpark believes that as one of the important scenes in the transport area, stationary transport has always been a weather-vane of urban development and people’s living standard. In recent years, deterioration of problems like traffic congestion and limited parking spaces has posed challenges for urban development. When traditional management models and solutions fail to effectively solve parking difficulties, it has become imperative to develop smart parking and solve urban parking problems with new stationery transport solutions utilizing artificial intelligence and big data. In the opinion of Alpark, the development of car connectivity and intellectualization is an irreversible global industrial development trend. Therefore, technological innovation and new product development have become top priorities. Relevant to the development of the entire transport area and the scene application characteristics of the stationery transport industry, Alpark has creatively come up with the solution integrating three advanced technologies, namely digitalization, intellectualization and block chain. To that end, Alpark has increased investment in scientific research, and has assembled a team of top-notch talent. Based on the big data platform architecture, artificial intelligence technology and firmware-software integration, it has developed over 100 internet big data and smart firmware core technologies with independent intellectual property. In addition, based on multiple dimensions including scene applications, intelligent algorithms, smart firmware and smart software, it has launched a series of urban smart parking application products, achieving the connection between smart parking and smart urban ecology. An application case at hand is the practice of Alpark in China. Since official commercialization started in 2017, Alpark city product has operated in tier-1 cities like Beijing, Shanghai, Guangzhou and Shenzen and many tier-2 and tier-3 cities, solving city congestion problems, and supporting traffic improvement and smart city construction of the cities it operates in, and is highly recognized by city administrators and residents. With the continuous increase in car ownership and city size, China is becoming the world’s largest global car technology application market. In such a market environment, Alpark has not only made remarkable achievements, its Alpark city, a city-level smart parking solution, has also continually matured with technological progress and market operation. Alpark has become China’s largest smart parking operation service platform. In the future, AIpark will continue to develop the international market, contribute Alpark static traffic smart parking technology and solutions to the world, devote itself to developing into the world's largest smart parking operation service platform, and contribute to solving the problem of limited parking spaces in cities across the world. Alpark's mission is to solve the problem of parking in an all-round way and make city life better.